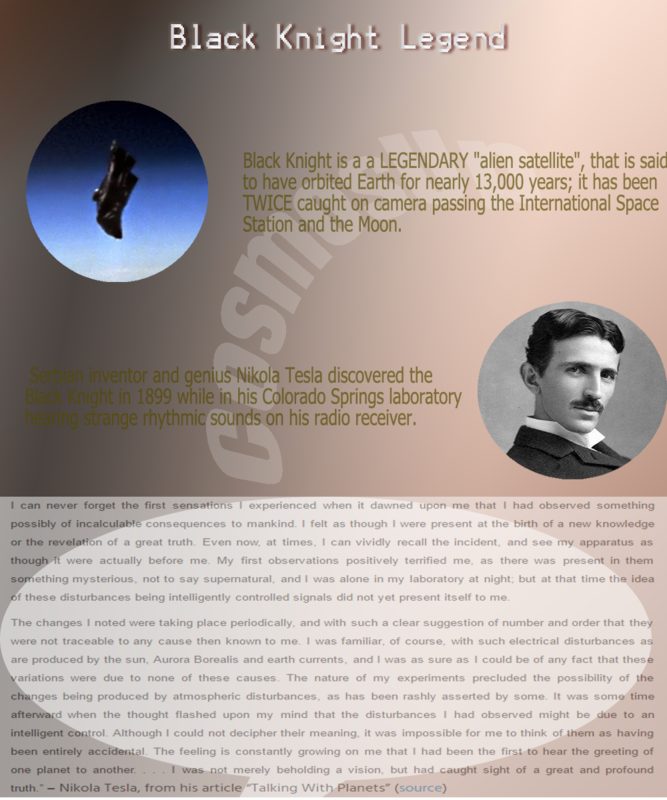 The primary evident piece of this story starts with signals picked up by Nikola Tesla (1856-1943), a brilliant Serbian inventor who spent the vast majority of his vocation in the USA. He was an electrical specialist and delivered works which investigated radio and remote transmissions. Today we know of some natural extraterrestrial repeating sources, for example, pulsars. These are highly magnetized, rotating neutron star that emits a beam of electromagnetic radiation. They were initially found in 1967 by Northern Irish astrophysicist Jocelyn Bell-Burnell (1943-). There are links to these NASA images in the full article which would not copy. 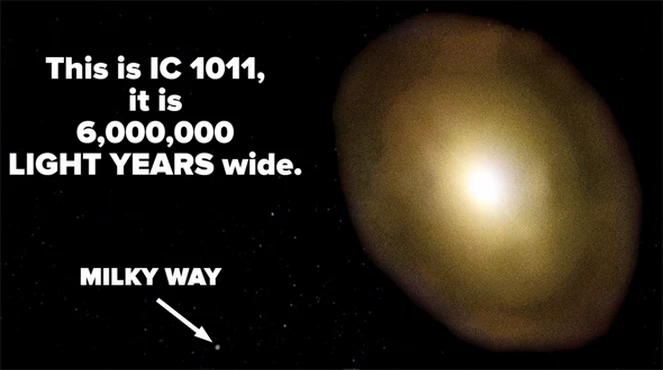 IC 1101 The largest galaxy Known so Far. Finding a true Earth analog orbiting within the habitable zone of a sun-like star is a sort of holy grail to astronomers and we are about to get a lot closer to detect one in the near future as new incredible inventions and technologies are available to us now. Today, our best planets’ hunter is the Kepler Telescope, a NASA spacecraft specifically designed to survey a portion of our region of the Milky Way galaxy to discover Earth like planets. So far, Kepler has found more than 1000 exoplanets but most of them are just hot gas giants like Jupiter orbiting too close to their parent star and thus they are completely inhospitable to life as we understand it. However, researchers think that a handful of Kepler’ planets found so far are a bit like Earth and orbit in the habitable zones of their host stars, where liquid water might exist. Detecting an Earth-sized planet is actually a real challenge; these planets are orbiting extremely bright stars, sometimes billions of times brighter than the reflection off the planet; But now scientists think that they have a solution. If we block the glaring light of other stars, then we can study the faint planets in more details. NASA’ engineers are now working on 2 technologies to help with this challenge: the starshade, big, flower-shaped spacecraft; and coronagraphs, special masks to block out light from stars’ bright surface. These two method will help us to take images of Earth like planets, and then use other instruments called spectrometers to search the planets’ atmospheres for chemical clues about whether life might exist there. Siegler is featured in the Crazy Engineering video. Over the past two decades, the study of exoplanets has grown more rapidly than any other field of astronomy. Hundreds of researchers across our globe now work to find new planets, measure their sizes and masses, characterize planetary orbits and more. Whenever our instruments, facilities and observing techniques become available, our insights into exoplanets dramatically advance. Today, our best astronomical assets for hunting planets is NASA’ Kepler Space telescope, a space probe launched by NASA in 2009 to discover Earth-size planets beyond our solar system. Kepler found more than 4500 planets candidate and confirmed more than 1000 planets and the tally is rising rapidly. From super-Earths to giants hot/cold Jupiters even rogue planets that sail free, our galaxy is a zoo of different kinds of worlds. As we’re progressing on that path, we accomplish fantastic new results. Though, we think we’ve seen it all, the universe can still surprise us. Astronomers hunting for exoplanets just stumble upon something extremely rare, something that we haven’t seen before. In a distant place in our galaxy, 1600 light years away from Earth, there’s a binary system composed not by stars but by failed stars. 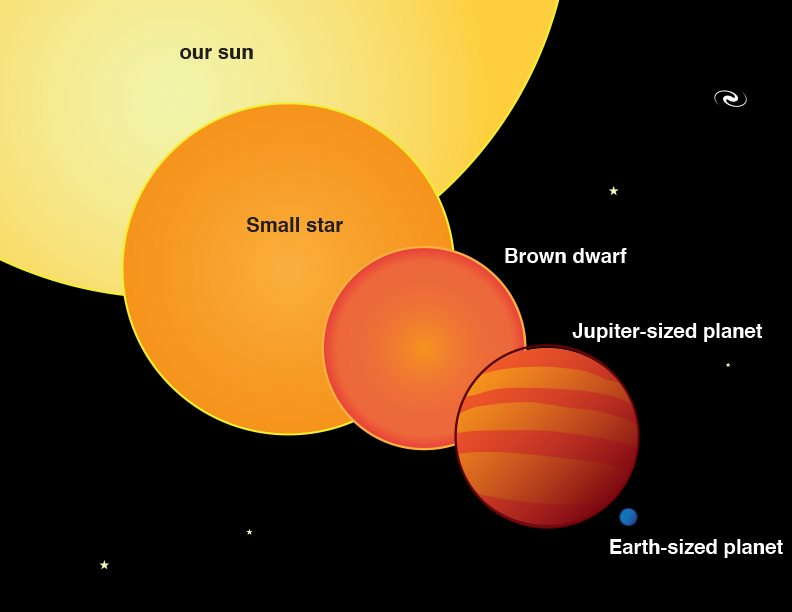 Two brown dwarf stars, low-mass stars with masses 0.2 M⊙ (solar masses) and ∼ 0.1 M⊙ located at a distance of 1.7 AU between them, reside there. Brown dwarfs occupy a niche in between stars and planets — massive objects too big to be planets and too small to fuse hydrogen and become stars. Brown dwarfs are intermediate in mass between stars and planets, making them important laboratories for testing theories about both classes of objects. They are also potentially a laboratory to test theories of planet formation, as recent studies show. We talk a little about these mysterious class of objects, but the discovery of a binary brown dwarf stars is not the strange part of this article: researchers have now found a planet orbiting the smaller brown dwarf of the binary system. Detecting planets that orbit brown dwarfs is really challenging. Brown dwarfs are low-luminosity objects, almost complete absence of light. There so dim and difficult to see that’s a really surprising thing to find a planet orbiting them. With present technology, substantially lower-mass companions to brown dwarfs, composed primarily of ice and rock, can only be discovered using the gravitational microlensing technique. Microlensing does not rely on light from either the host or planet, but rather infers the existence and properties of these bodies from their deflection and magnification of light from a more distant star that is fortuitously aligned with the system. With this technique, only 4 super-Jupiter planets orbiting brown dwarfs have been detected to date. says Ohio State University Andrew Gould, part of the team who reported the find. In the case of a brown dwarf, even though it’s emitting little or no light, [microlensing] can still betray its presence. In a study* published online on 13 Jul 2015, astronomers using a gravitational microlensing technique have found a Venus-mass planet orbiting the brown dwarf. A rocky planet orbiting a failed star has never been observed before. So, the discovery was really first of its kind. The Venus-mass planet, dubbed OGLE-2013-BLG-0723B, orbits its host in about 400 days and at a distance of 50 million kilometers (31 million miles) — about the same distance as Mercury’s closest approach to our sun. The Venus-mass planet is 30% less massive than the Earth and only slightly less massive than Venus. We’re looking forward in the future to more microlensing detections. Venus-mass planet or a star? The discovery of OGLE-2013-BLG-0723B was of special scientific interest in many aspects. 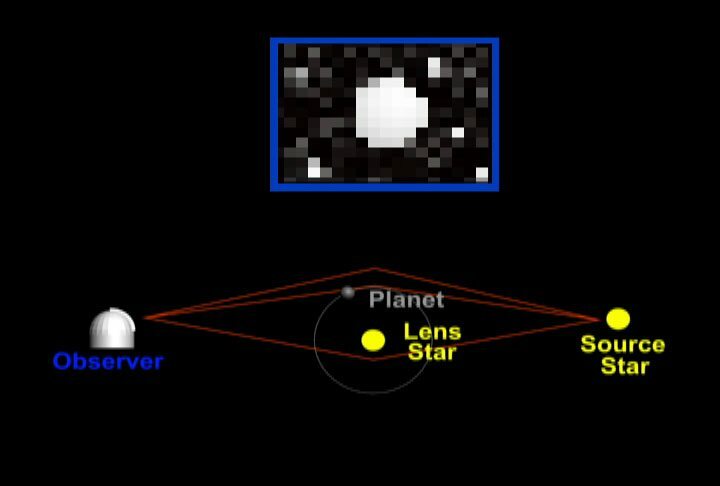 First, the planet itself is the lowest-mass planet among those discovered by using the microlensing method. Second, the host of the planet is a substellar-mass brown dwarf suggesting the possibility that an ice-rock planets can be formed in the outer parts of the accretion disk around a brown dwarf. 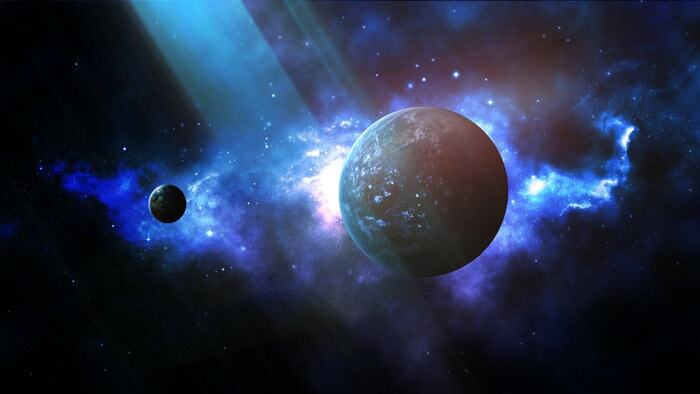 Third, the planet belongs to a binary system where the planet orbits the lower-mass component of the binary. Finally, the planet/host mass ratio indicates that the system may be viewed either as a scaled-down version of a planet plus a star or as a scaled-up version of a moon plus a planet orbiting a star, suggesting that the formation processes of companions within accretion disks around stars, brown dwarfs, and planets are similar. Based on statistical evidence, that rocky planets around low-mass stellar pairs like this one are likely quite common, enough so that every star in a similar system may boast a terrestrial world. A small portion of those found in the future may well be warm enough to hold liquid water on their surface, and as microlensing surveys improve and space-based efforts continue, more of these worlds should be identified. But this isn’t the end of the story. Today, in a paper** uploaded on arxiv servers, researchers could demolish the venus-mass planet hypothesis. In this work, we present another interpretation of the lensing event OGLE-2013-BLG-0723 based on a new solution of lensing parameters found from the reanalysis of the event. From this, we find a new solution where the lens is composed of 2 bodies in contrast to the 3-body solution of the previous analysis. Researchers suggest that the lens system is actually composed of two low-mass stars with ∼ 0.2 M⊙ (solar masses) and ∼ 0.1 M⊙. So is it a venus-mass planet or just two low-mass stars? Considering that two dramatically different solutions can approximately explain the observed light curve, the event suggests the need of carefully testing all possible lens-system geometries. Bottom line: Microlensing event OGLE-2013-BLG-0723 was discovered by the Optical Gravitational Lensing Experiment (OGLE-IV) on May 12, 2013 using its 1.3m Warsaw telescope at the Las Campanas Observatory in Chile. The discovery of the first exoplanet back in 1995 received widespread media attention and was seen as an important landmark in a new research field, the planet hunting research. The discovery was very important not for its magnitude, the planet itself, but because what it means for the future of planetary discovery and mapping. Planet hunting program is leading humankind on a voyage of unprecedented scope promising insight into ours origins and beyond. Exoplanet exploration’ goal is to find and characterize planetary systems and Earth-like planets around nearby stars, an essential step to reach our ultimate goals, the discovery of habitable planets and evidence of life on other planets. First planet hunting phase has been done with ground telescopes around the world, pushing the limits of their ability but with the launch of NASA Kepler Space Telescope in 2009, researchers have found thousands of planets orbiting other stars, dozens of these exoplanets are Earth-size planets in or near the habitable zone — the range of distance from a star where liquid water might pool on the planet’s surface. Future NASA missions, like James Webb Space Telescope in space, will extend this exoplanetary census much farther in the coming years, discovering and characterizing more and more planets beyond our solar system. One of the most popular and most effective method for locating and confirming extrasolar planets is called the Doppler radial velocity method. This technique largely relies on the fact that a star does not remain completely stationary, a planet’s gravity also affects the host star in return. A planet could produce changes in position and velocity of the star as they orbit their common center of mass, as result, the host star moves, ever so slightly, in a small circle or ellipse, responding to the gravitational tug of its smaller companion. So, using highly sensitive spectrographs, researchers can track a star’s spectrum, searching for periodic shifts and thus picking out exoplanets across the night sky. The radial velocity method has proven itself fruitful in the last decades both for the identification of new exoplanet and the confirmation of exoplanets detected by other methods. But with the recent developments in planet hunting, this method becomes gradually inefficient especially when it used to detect planet around small, cool stars (also called M-stars). To date, Kepler telescope have found thousands of exoplanets, many of them are orbiting M-dwarf stars. So, its become clearly that M cool stars class represent valuable targets for the identification of new Earth-mass planetary companions in the habitable zone. However, in the case of these low-mass stars, looking at that wobble with the radial velocity becomes gradually harder, as I say, due to the false-positive signals. The wobble could indicate the presence of a planet, but other things can also cause the phenomenon (e.g stellar spots). That’s why researchers decided to refine the radial velocity technique in this latest study. In a new study* published online in The Astrophysical Journal, the Carnegie Institute researchers describe how they fix the radial velocity’ accuracy problem. Researchers developed a methane isotopologue gas cell that offers a high absorption line density in the regime of near-infrared wavelengths. This development represents a better calibration tool to improve the overall technology for the radial velocity work. Basically, they still use the radial velocity technique, but they switch from visible to infrared wavelengths when making measurements. Jonathan Gagne, from Carnegie Institution for Science in the US, explained. In the paper, they also present the first results of this new tool. Researchers use this technological upgrade at the NASA Infrared Telescope Facility located at the top of Mauna Kea in Hawaii to survey 32 late-type, nearby stars mostly selected from known members of young moving groups. Fast results? Scientists confirmed several known planets and binary systems, and also identified a few new planetary candidates. said Peter Gao from California Institute of Technology. This new tool could be huge when it comes to confirming exoplanets in the future. It also could allow the detection of Super-Earths near the habitable zone of mid-M dwarfs in the solar neighborhood. These will serve as a crucial complement to transiting exoplanet studies, as the combination of both the radial velocity and transit methods will provide a measurement of the mean planet density and put strong constraints on the physical properties of future Earth-like discoveries. Matter as we know it, all the planets, stars, galaxies, cluster of galaxies that can be seen make up just 5 percent of the cosmos. Approximately 2% of this percentage is made of stuff astronomers can’t see but still eluded detection. Recent cosmological models predicts that the rest of this matter should be located in large-scale structures, a network of galaxies tied together by mysterious forces. These gigantic networks form the cosmic web, a structure which contains most of the material in the universe. The cosmic web has dense regions made up of galaxy clusters and groups, sparsely populated regions devoid of galaxies, as well as the filaments that link overdense regions. The filaments are like bridges connecting the denser regions in the cosmic web. Imagine threads woven into the web. 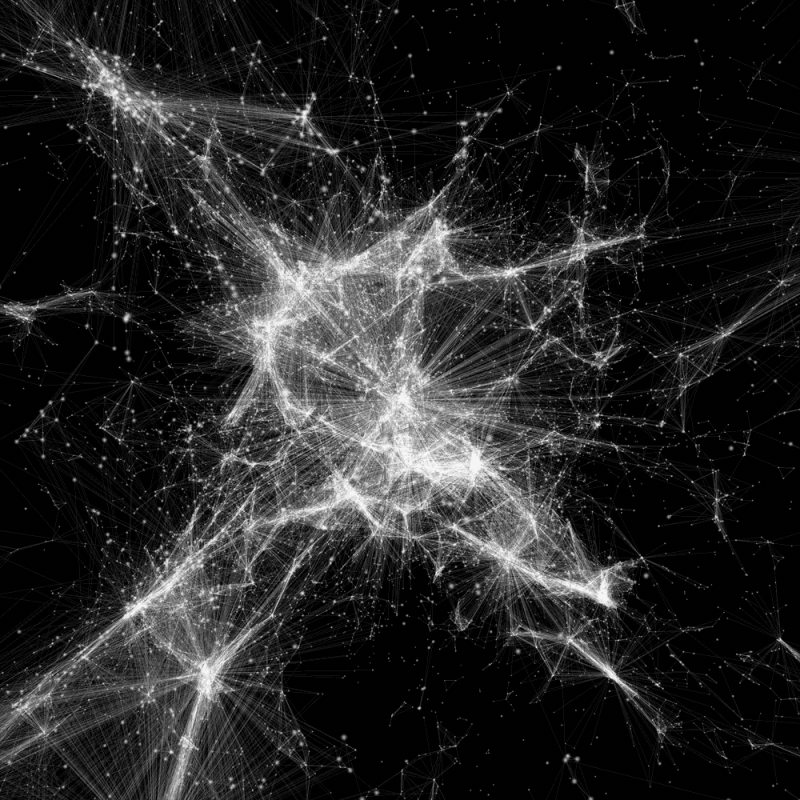 In 2014 researchers, at the University of California, create a video showing these structures in the cosmic web. Its was amazing but now cosmologists and designers at Northeastern’s Center for Complex Network Research designed a mind boggling model of the cosmic web, offering complex blueprints for how galaxies fit together. You don’t need a physics PhD to appreciate the beauty of it. Little is known about architecture of the cosmic web or its characteristics. Our research used data from 24,000 galaxies with more than 100,000 connections, to construct multiple models of it. These three interactive visualizations help us imagine the space, show us differences between the models, and give us insight into the fundamental structure of the universe. Before, the cosmic web was more like a metaphor. This is the first time somebody has made these calculations and thought about it as an actual network.